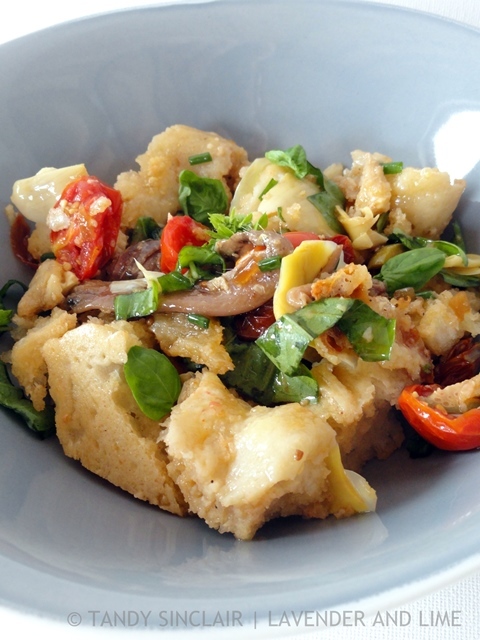 Panzanella originates in the Tuscany region of Italy and comprises of stale bread and fresh summer tomatoes. It is dressed with olive oil and vinegar and is the perfect way to make use of ‘yesterday’s’ loaf of bread. In Italy we buy a ciabatta every day, just before lunch. We don’t often finish the loaf for our mid day meal, and knowing it does not keep well overnight we ensure we eat the rest of it with cheese at dinner time. It is amazing how some people who grow up with money feel that they are entitled! It is as if their parents have trained them to expect that everything will be handed to them. I met a young man who was able to live a privileged life without having to work for it. He did not need to earn money to support his family. And his attitude to everyone around him was one of condescension. When I met him, his attitude was not as pronounced but as he became bolder and less shy, the attitude showed up more and more often. He felt nothing about destroying someone else’s property shrugging his shoulders at the situation and not taking responsibility for the costs involved. He stole company time and business resources to earn money on the side, not for the income but more as a way of showing he was important. He did not feel the need to act in a manner becoming an employee, but rather acted as the boss, arriving late for work, taking time off and not bothering to communicate with the person who employed him. And in the same breath I could look to our own lives and how we never act like we deserve what we have. Both Dave and I were raised to work hard for what we need. To make the best of what we are given and to ensure our integrity is always intact. We have had highs and lows in our life, but we have always lived well, and eaten well. And to me the part about eating well has always been important. And this does not mean spending a lot of money on food. You can eat well by making the most of the ingredients you have to hand. For my panzanella salad I made use of our left over focaccia and the only concession I made to the original dish was using fresh basil from my garden. The same weekend I made my salad, Lorraine made hers using the most amazing looking fresh tomatoes. I make a hot version of this (not lettuce obviously) as we often have excess stale sourdough and there are only so many croutons to be made! Of course, using up that stale bread is one of the reasons we have money to travel and it makes us appreciate it even more. I think we are kindred spirits. This is one of my favourites! Every thing that is delicious is in this salad. I love how you used left over ingredients and fresh herbs from your garden for this dish. I don’t believe in wasting food. What a scrumptious salad, Tandy. I’m with you on your bafflement at entitled attitudes. I am always shocked when I come across people like that. Always support the idea of re-using food and not letting it go to waste. 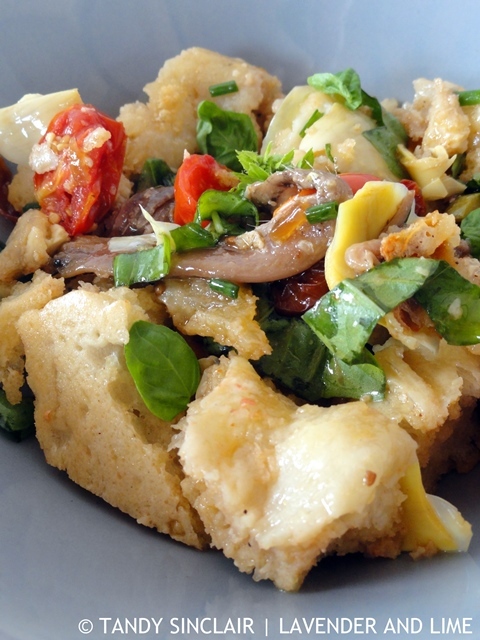 Great post about panzanella salad. It’s amazing how fresh tomatoes can improve tastes remarkably. Nice pics! This looks really delicious, Tandy. Hubby and I feel exactly the same way that you and Dave do. Waste not, want not. That young man sounds very foolish. Very well said. I can’t stand to be around people like that. I pity them! This panzanella is a great way to eat well without it costing a fortune. It looks terrific! Wow, I’ve never heard of a bread salad, but it looks wonderfully delicious! Some people are just like that young boy, I they never realize what they are doing. What a best use of leftover focaccia. This panzanella would sure make an awesome dinner. I love panzanella salad with loads of fresh Italian ingredients. Yours looks super delicious! The Italians have a great way of using everything and having zero food waste which is very important for us and society. Hi Tandy, so sad that someone thinks it’s okay to behave like that. Love panzanella, such a lovely salad. It is sad, but hopefully one day they will be forced to grow up! Focaccia or ciabatta, both sound scrumptious in this recipe and I love not wasting food ~ even bread! What a tasty idea for a unique dinner or snack. And entitlement. I never understand why parents think they should spoil their kids. My sister in law and brother in law just “surprised” their son with a trip to Disneyworld, just him. I mean, this cost them thousands of dollars, it’s like, hmmmmm, but what will this kid expect for a high school graduation gift or wedding? We’re building kids up for failure I think! That is a lot of money to spend and one can only hope they can maintain the surprises throughout his life or he will end up in a bad situation for sure!